We've been so busy...Mr. Wild and I (and the cat) drove to Arizona and arrived 2 days before Christmas at our little desert hideaway. The van was loaded to the max, everything INCLUDING the kitchen sink! The plan...to tear out all the old kitchen cabinets and replace with new white cabinets, new sink and faucet. We replaced the appliances last winter and I ordered and had the cabinets delivered last spring before I went back to Minnesota. We found the sink I wanted so badly, it was discontinued right before I started looking for one, no one had one. Then we found a plumbing supply in southern Minnesota that had one on display in white like I wanted. Since it was a display sink and discontinued they sold it to us for half price...I was SOOOOO happy! And yes, we hauled the kitchen sink with us! I'm not showing you all of it since it's still a work in progress, Mr. Wild had 2 1/2 weeks to do this and then he had to fly back to Minnesota (it took him only 9 days). I stay here all winter and continue my internet pattern business and then do as much as I can on the house during the winter. I've never had white cabinets and as soon as he got the first wall cabinet up I knew I would be a happy camper. I started putting some of the old stuff up on top before he even had the base cabinets in. 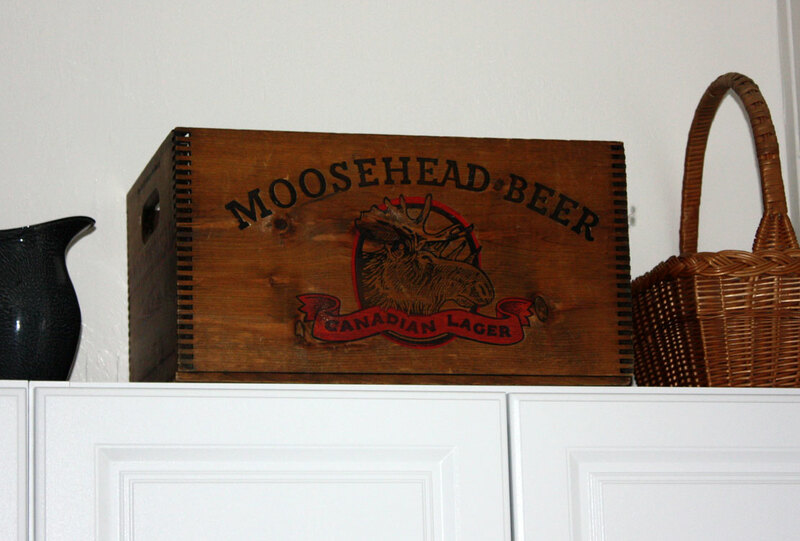 We're not big beer drinkers but I couldn't resist this old Moosehead crate at the flea market here last winter and I love the old wood tones with the white. I have a thing for moose. A few more flea market finds, I'm still trying to decorate on a flea market budget. 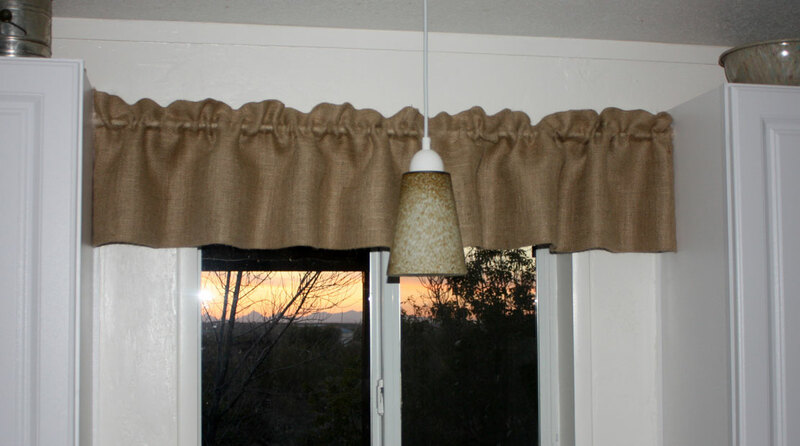 For the first time I tried using burlap for a valance and I love it! Can you see the mountains off in the distance? The sun had just set and worked out better for pictures. The mountains in the distance are the Tucson Mountains, we are looking to the west and on the other side of the mountains is The Arizona Sonoran Desert Museum and Old Tucson where all the old westerns were filmed years ago. They are the mountains you always see in the background in the old western movies when they are filming out in the desert or in an old western town. As you can see I was trying out paint samples of yellow but now I need samples of a very light tan. I'm still so undecided on the wall color. My little collection of Fiesta Mini Disc Pitchers, I forgot to take a picture of the cabinet inside, I have the Fiesta dishes in the same colors. 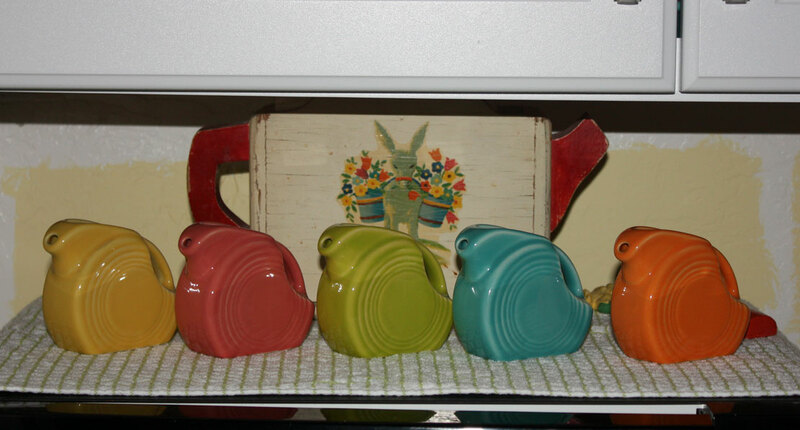 The little coffee pot napkin holder with the vintage donkey decal was found last winter at the flea market. 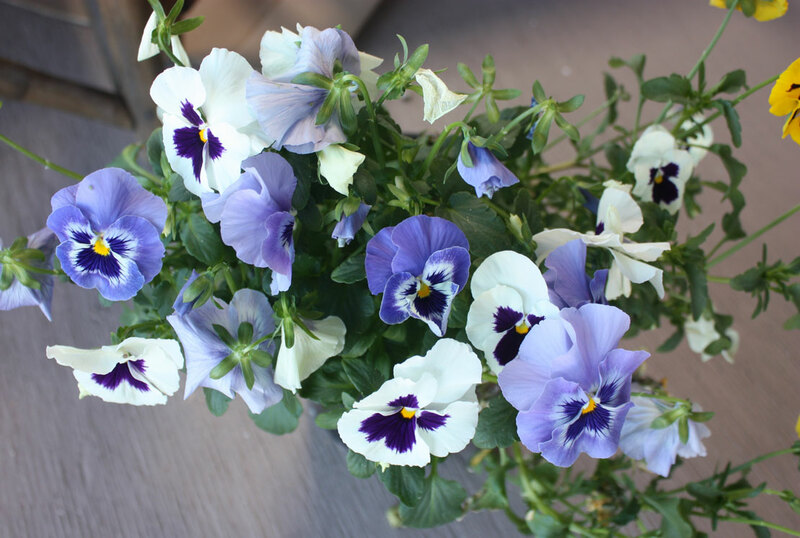 And of course I have to show you the flowers! 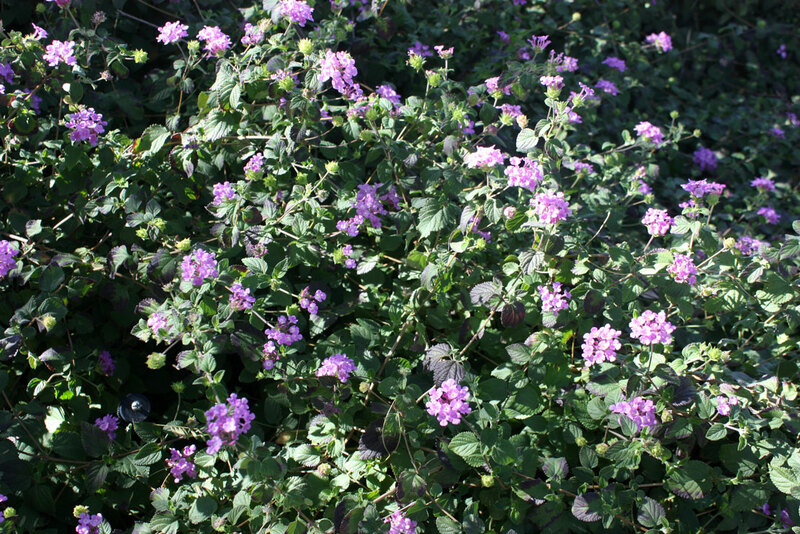 Being born and raised in Minnesota this is just too exciting to be able to have live flowers outside in January!!! I have never seen that happen. Normally it gets cold enough to stop blooming but this winter, while everyone else is freezing including Mr. Wild in Minnesota, Arizona has had much higher than average temps. Last winter I was posting pictures of the more than average snowfall we had here. I've been so busy tearing out carpeting and prepping the floors...pulling staples and carpet tacking. We're going to try the plywood ripped into 6" wide strips and then face nailed to resemble plank flooring. Since this is ranch country I'm going with a little bit of a western ranch feel, maybe the white kitchen cabinets don't quit fit that look but I wanted a bright kitchen since the window is so small and there are trees outside the window, I don't want to do away with the trees! We have cork tiles to do the kitchen floor but that will have to wait until next winter, the plywood plank floors will probably be 2 winters from now. Lots to do... this weekend I'm going to start getting a very small raised garden ready to plant, planting in February??? I still can't even comprehend that! 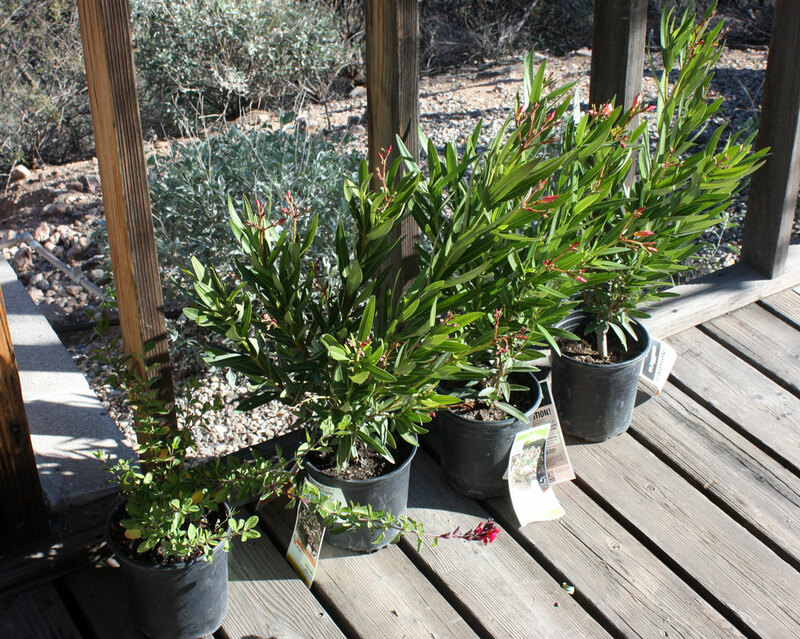 On top of that I'm off to the nursery tomorrow to pick up a few flowers....in January!!! Back in Minnesota the ground is so frozen that it may never thaw out! Even Wyoming isn't that cold! Weather in Arizona has been awesome. Am gonna hate to see what the summer will be like. 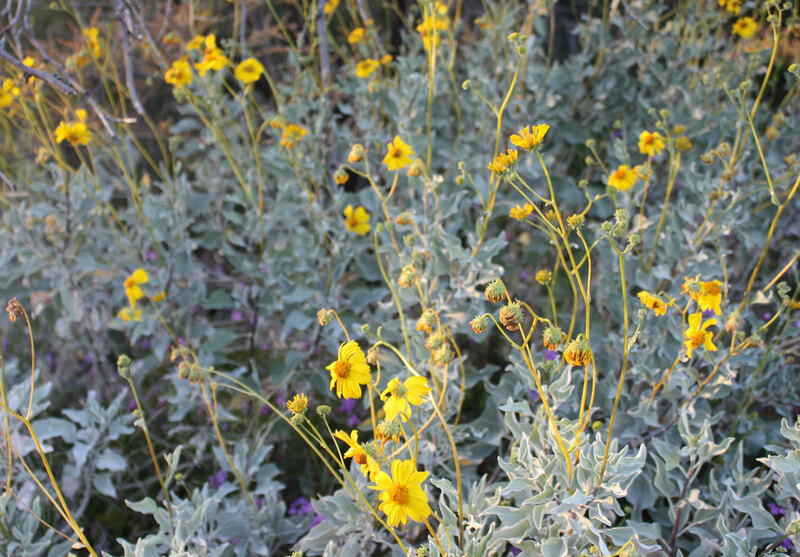 We live in Arizona so that we can have winter flowers blooming and vegetables. Can't wait to see the further progress. Have a great one. Thanks for sharing. I'm so jealous of your weather. While I am typing this from Indiana, it is MINUS 15… Yes, you read that right. I am in the middle of painting my cabinets white! I'm sure I will be posting! Ha! 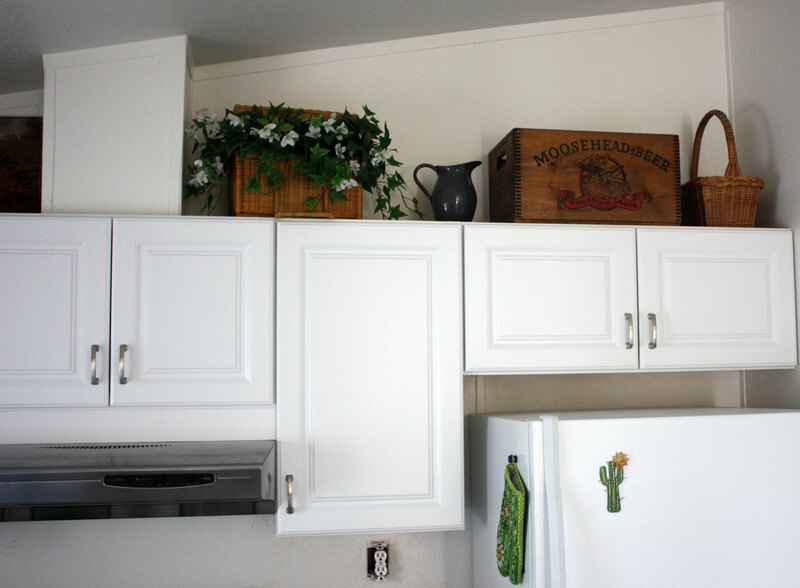 Love how you've decorated the tops of the cabinets. Can not wait to see your flooring. Not sure I've seen that look before, but it sounds interesting! Oh, to be where the weather is above 20 degrees! My you've been busy Faye...love the little peek and can't wait to see more! I also love your collection of little pitchers! I bought a regular size one (my very first) this past summer for my trailer and would love another! You guys are so making great progress on the home! WOW!!! I bet you don't miss this WINTER! LOL!! Loved seeing your kitchen and looking forward to seeing more! Oh I envy you your warm Arizona winter! We get the same cold winters here in Northern Michigan as Minnesota. Your kitchen is going to be fabulous based on what you've already done. I am thinking of doing the plywood plank floors too...saving my pennies and hope to do it this summer. Thank you for sharing it at What We Accomplished Wednesdays. Have a great weekend! Holy moly...are you busy, or what???? I like the idea of the plywood plank floors. Your little pitchers are so cute. I can't believe you are planting flowers, Faye! Do you want those seeds? Have fun fixing your place up. I'm anxious to see your sink.